Few people who watch the well-trained polo ponies in the fast tournament games have, I imagine, any idea of the amount of time, trouble, and patience expended on their education. I was fortunate in securing the assistance of Comte Jean de Madre in writing and illustrating this article ; understanding thoroughly the manège of the haute école, his ponies are trained to perfection. Well known as one of the best whips, the Count is also one of the keenest in the hunting field, and his model farm near Rugby is in the best centre for hunting and polo. 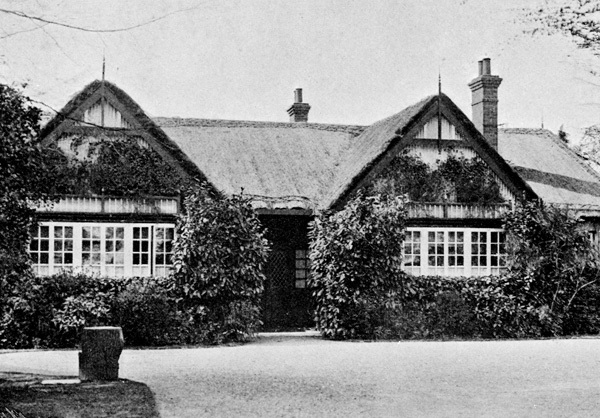 The Count takes a very natural pride in his English home, which he planned and designed himself, and the interior of the bungalow is a veritable museum of sporting trophies – racing, coaching, and hunting – while polo is represented by numerous cups and medals; the walls of pitch-pine being covered with rare old prints illustrating sport of every description. However, an account of the bungalow and all the champion animals one meets on the farm would fill an issue of the magazine, for they range from polo ponies down to pigs and hens, and I think after that remark I had better “get away on” to the stables. First one comes to a line of comfortable loose boxes, filled with a good type of weight-carriers, who certainly do not look any the worse for the open season we have just had; but then their master loves and appreciates his horses, studies their comfort and well-being more than his own pleasure, and in return they will do anything for him, vice of any description being unknown in his stables, although they are not all by any means such “lambs” when they first come to the bungalow. Other yards beyond this are filled with polo ponies, harness-rooms, the forge, etc., and beyond these compact buildings is the riding school, where the principal part of a pony’s education is conducted. The school is 300 ft by 40 ft (91m x 12m), the height to the eaves 14 ft (4m) and it is well lighted and ventilated by windows; inside, the walls of matchboard are double near the ground and slope outwards, which allows room for the rider’s leg when turning near the wall; and also if a pony slips up he slides down against the side without damage to himself or the wall. The floor is laid down with tan, which is kept well raked, and in summer gets a fine spray of water every morning to lay the dust. Unfortunately the light in the school is not strong enough for instantaneous photography, and the photographs taken in the field do not of course give one the idea of ponies manoeuvring in a limited space; but I have tried to illustrate the various movements with one or two ponies, and the reader must imagine himself standing in the centre of the school with twenty of them. 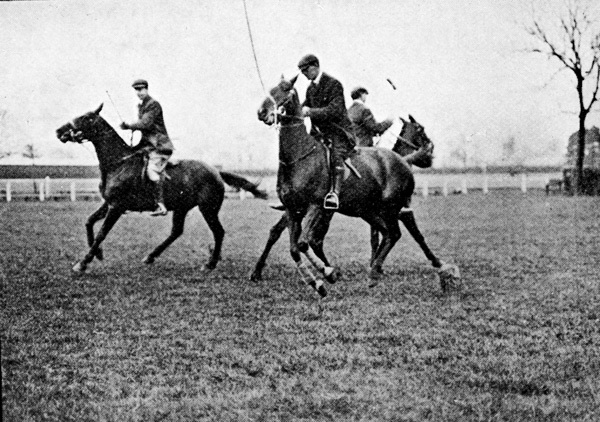 One or two will perhaps be standing still in the centre, varying this by backing, while the rest wind in and out, following each other at the same even pace, cantering round in circles to right and left, coming the length of the school in an elongated figure of eight, while one at the side will perhaps be ridden full tilt at the end wall, and turn in less than his own length; add to this the muffled thud of galloping feet, the jingle of bits, and the sharp word of command, and you have my impression of the first riding-school I saw at Springhill Farm, where Captain and Mr. George Miller, followed by a long string of boys, were manoeuvring their ponies with the precision of clockwork machinery. Mr. Miller buys only trained ponies, but, they all go through the school exercises, and two of his men are really artists; it is a pleasure to watch them ride. The Rugby team have the best-trained ponies in England. 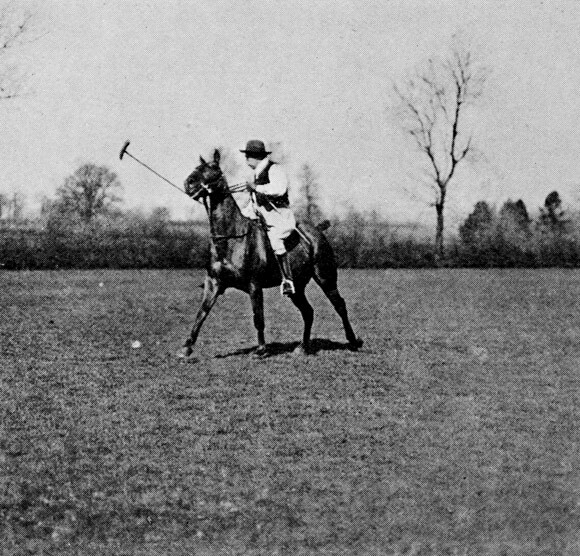 As a first-class player said, “You cannot get at them, they turn inside you every time.” Ponies bred from mares that have been good players should inherit an instinct for the game, and there are a few cases in which a pony takes naturally to polo and requires very little training; but the greatest difficulty of the breeders is to attain the correct height, 14.2 hands. Some of the best polo ponies playing now are by thoroughbred horses out of polo mares, while the Comte de Madre’s celebrated ‘Mademoiselle’ is by ‘Loved One’ out of a hunter mare, ‘Madame Angot’ by ‘Munster Blazer’- grand dam by ‘Woodpecker’, breeding good enough for anything. She is the ideal type of compact weight-carrier. Amongst other prizes she has won being the Challenge Cup at Islington five times and Champion Cup at Hurlingham twice. The Comte de Madre breeds a few ponies, and so far he has been very successful with ‘Dandy’, a Barb from Tunis, 14.1 h. This is a well-made, compact pony with 7&#190 inches (19.7 cm) bone below the knee, and his stock look most promising youngsters. The foals in winter get 3 lb. (1.36 kg) of old cracked beans and plenty of good hay; each foal has a separate bucket, placed at some distance apart to prevent any kicking or hustling, and the same man feeds them every day, so that they get used to his voice, and allow themselves to be caught and handled, the consequence being that when they are brought in as three-year-olds to be trained they are as a rule perfectly gentle and fearless. Their mouths are made on a straight bar bit with keys, and they are driven in long reins. The object of the reins is to make a pony handy, to teach him to answer a feeling on either rein, not only by turning his head, but to turn properly on his hocks, the pressure of the reins on the quarters acting as will the pressure of the rider’s leg when he is backed. Most people who have ridden badly trained horses know the discomfort of a horse answering with his head while the rest of him remains immovable or continues in the wrong direction, and other horses will only answer to one side of their mouth. A course of long reins will generally cure these tricks; the driver walks on the inside of the circle, and not straight behind the horse. The ponies in long reins must learn to circle to right and to left, and are taught to obey as much with the voice as the pressure of the rein, the same words of command always being used, the pony soon growing to understand. The most important lesson is to make them rein back collectedly, which teaches them to use their hocks, and gives them wonderful balance; many youngsters will fight against this at first, and it is best to get a boy to stand in front of them; the foreleg in advance is tapped lightly, while pressure is put on the reins and the pony told to back. When reining back a pony in the saddle the rider should lean forward and take the weight off the hindquarters, and with his hands low on each side of the withers he should feel the right rein if the off fore is in advance, using pressure with his left leg, and vice versa. When they will stop, back, and circle to either hand a light boy is put on them in the school, they are ridden quietly about, and after two months training they are turned out again. 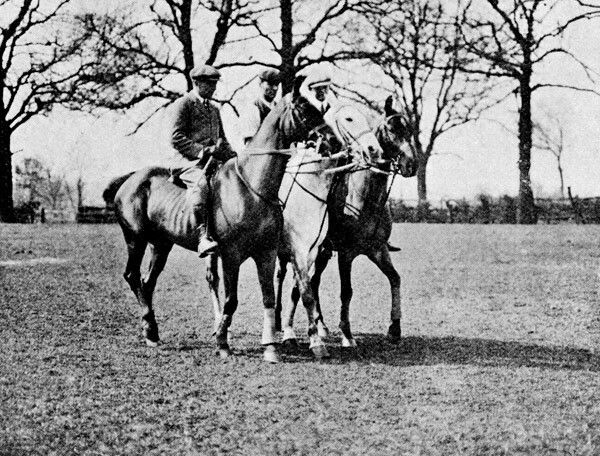 Rising four, their education begins in earnest, and they get about four months’ training, being also ridden on the roads to get them used to traffic, the boy generally carrying a polo stick at exercise; but he is not allowed to hit a ball, and in the field they are often exercised without a bit in their mouths, boys with good hands being rare. The first lesson in the school the pony has to learn is to change his legs correctly. He must always lead with the foreleg in the direction in which he is moving; for instance, in a left-hand circle the near fore must lead, and this also applies in bending from right to left. Many ponies do not change properly, and they are easily bowled over in a collision because they are off their balance. 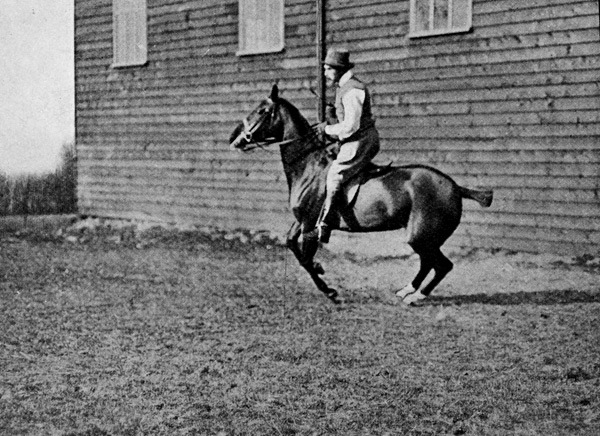 Some turn on their forelegs, so that their hindquarters swing out and they are liable to slip up; others change with the fore without changing behind, they are disconnected, and are moving like an Iceland pony, which gives the rider the unpleasant and jolty sensation of riding against the canter. The correct way of turning and changing is on their hocks, using the inward hindleg as a pivot to turn on; in changing, a pony throws his balance from one hindleg to the other, and changes his forelegs simultaneously. It would require a cinematograph to define this properly. When cantering slowly the change is a perceptible pause, while they shift their balance and direction like a skater doing the outside edge with the right and then with the left foot. There are few riders who know how to use their legs to make the ponies change and turn, yet the rule is simple: pressure of the left leg to turn to the right, right leg to turn left-handed, and discretion should be used according to the temperament of the pony as to the pressure employed. The slightest touch will turn some ponies, while others require a fairly vigorous kick. When swinging sharply to the right the rider presses with his left leg behind the girths to make the pony turn on his hocks, his hand slightly checks and follows over in the direction of the turn, the reins pressing the left side of the pony’s neck; in this way the pony is collected and well balanced, and can twist in the smallest space. To turn and gallop in the opposite direction the pony must be stopped dead and swung round on his hocks. In the school they soon learn this, as they are galloped at the end wall, and turned with their heads inwards against the side. They very rarely slip up. Then they have to learn to jump off from a stand into, a canter or gallop, and to keep the same even pace, with a slack rein; they must mind their own business, and stand still with others galloping round them. To meet other ponies they are first walked between two coming from the opposite direction, gradually increasing the pace until the novice will gallop through the narrowest opening. They are trained to bump and ride off by two ponies closing in on either side, and the youngster is taught to push off first one and then the other. When he has done well he is petted and made much of, so that he takes a pride in bumping and does not shirk hard knocks. When they finally understand how to change, back, and turn to perfection in the riding school, they are taken out into the field and get used to the rider swinging his stick about. As soon as they are quiet with the stick the rider will walk after a ball, gently tapping it along while talking to and encouraging the pony, who soon realises that the object of the stick is the ball, and some ponies begin to watch and follow it on their own account. 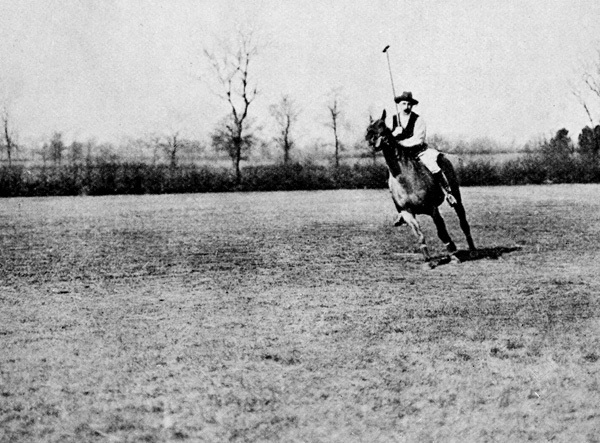 The greatest care should be taken to leave the pony’s head free when making a stroke, so that he may not associate the act of striking the ball with any jerk to his mouth, which would make him take a dislike to the game; and the rider must sit still in the saddle, and keep his leg on the side of the ball perfectly motionless. If a pony is shy of the ball, he should be walked up to it with his head slightly turned from it, the rider using pressure of his left leg if the ball is on the right hand. According to the progress made the pace is increased, and towards the end of his four-year-old season the pony is taken out to watch practice games. Aged five they are played in cantering games, never being allowed to rush or get excited, and finally, as six-year-olds, after three years of schooling, if all has gone well, they are fit to play in the fast tournaments. Considering the time and expense of their education, the prices, that first-class ponies fetch are not extraordinary. ‘Sailor’ made the high price of £750 sterling at Mr. Miller’s sale in 1898, and ‘Policy’ made the same price in 1899. 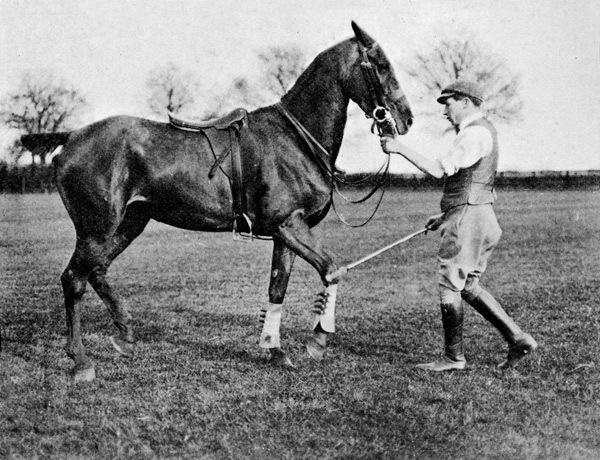 The best type of polo pony is the miniature 14 stone (89 kg) blood hunter, with intelligent head, broad forehead, and good eye. A hot tempered pony is useless for polo, indeed ponies require to have the temper of a saint. 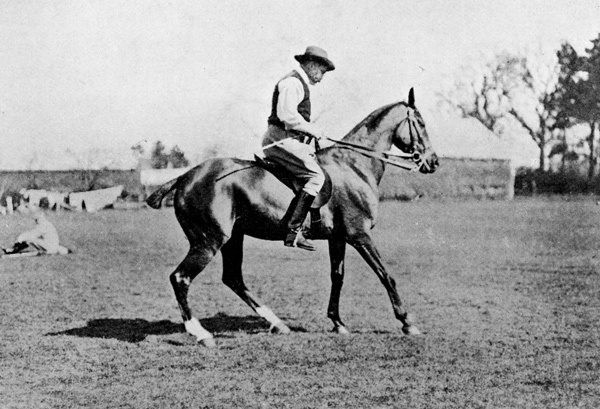 They should be big as far as weight and substance go, with good bone, a well-put-on head and neck giving length in front of the saddle, good shoulders – and this can best be judged by galloping downhill: the rider feels how the pony moves; if the action is short or stilted the shoulders are not good, however excellent they may look. Depth through the heart, for they must be able to stay, short back strong behind the saddle, good hocks well let down, good straight forelegs with strong well-sloped pasterns and sound feet, are essential, while the action must be straight and true. The frog and bars of the feet should not be pared, for they are a natural spongy pad to prevent undue concussion, and the ponies have to gallop on hard ground, often carrying heavy weights; the feet should be pared level twice a month if necessary, and the toes shortened. Their legs should be made hard and muscular by plenty of walking exercise, but when once they are fit and playing polo, gentle exercise is all they require. Ponies of nervous disposition should not be played too often, as they take so much more out of themselves than a placid, easy-going pony. The Comte de Madre has a beautiful stud of ponies; needless to say they have not been got together in one season. They are the pick of nine years selection, and the Comte has thought of the original idea of mounting the Rokeby team, of which he is captain, on ponies of the same colours. They will play in all the principal tournaments to the end of the season. The players include Captains Dunbar, Harman, and Baynes, while Major Ansell and Captain Chaplin will also be out frequently. It would be impossible to find a better team of ponies than the greys, which are up to any weight, and their merits are well known. There are four teams: Grey, Chestnut, Bay and Brown. The greys consist of ‘Mademoiselle’, ‘Greedy Boy’, and ‘Pigeon’; who are Irish, and ‘Taffy’ is a Welshman, by ‘Utility’. 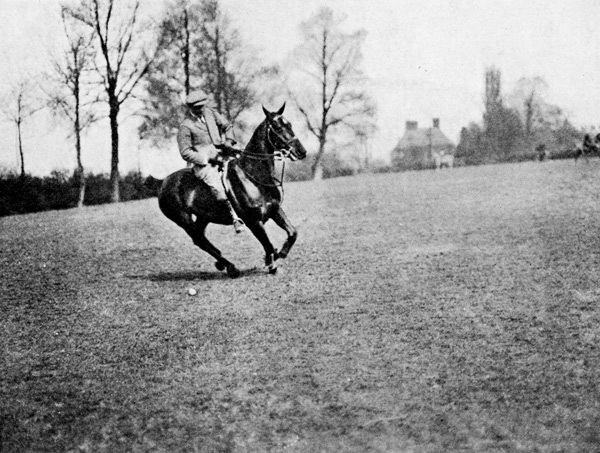 The chestnut team includes ‘Sylvan Lady’ by ‘Ascetic’; ‘Rufus’, twice second to ‘Mademoiselle’ at Hurlingham in the heavy-weight class; ‘Cicero’, an Argentine; and ‘Sea-Side’ by ‘Ocean Wave’. The bays are, ‘John’, ‘Meddler’, ‘Fancy’, and ‘The Kitten’. The brown team includes ‘Summer Lightning’, a charming mare, winner of numerous prizes, ‘Tiger’, ‘Miss Clarendon’, and ‘Skylark’. Each player has also two spare ponies of the same colours who are second season ponies and nearly as accomplished as the crack teams. 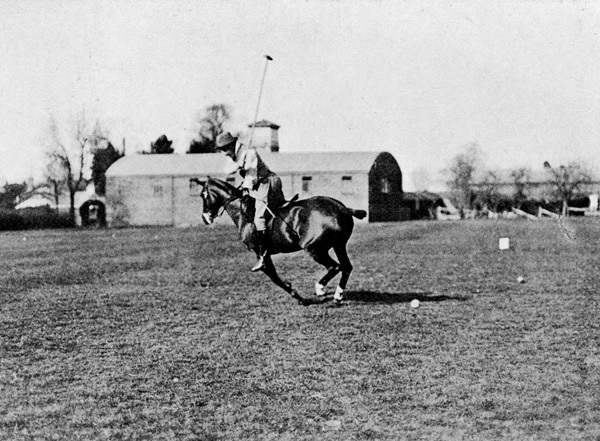 Certainly it gives additional interest to the onlooker when he knows how the ponies are trained and what they should and should not do; and in watching the performance of a first-class pony and player one sees immediately the immense pull a handy pony has, even if he is comparatively slow, over the fast, racing type of animal that will take half the polo ground to turn in. Of course there are some good ponies of, this type, but as a rule they are too lanky and uncoupled. Polo is all sharp turns and stops, and the animal required is compact, strong, and wiry as a cat.